Disclaimer: This app is intended for entertainment purposes only and does not provide true insult app functionality. Do you always wish if you have something to say to a stupid argument? You wish you had something you can slap some stupid person just by saying something? Here is the app you must be download for that. This app contains 25 most hilarious insults you can use to slap the stupid argument! 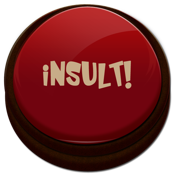 Never be short of an insult again, download the hilarious Insult Button – today!